Wood is a great material for construction. It’s strong, easy to cut, readily available which means it is cost effective, and it is also suitable for a variety of uses. There are lots of different types, though, each with their own hardness, colour, and grain. 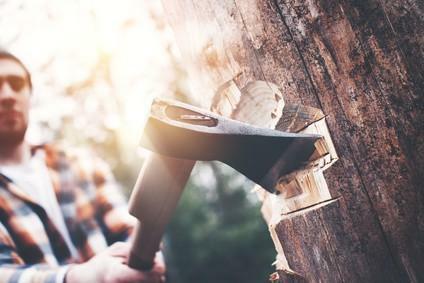 When using in large projects you’ll want to consider the strongest type of wood to provide as much resilience to the structure as possible, and in this article, we will be looking at the best options to choose from, especially if you need something tough. Strongest Type of Wood: Why is some wood harder than others? There are two main categories of wood – softwood and hardwood. The differences between the two are clear in their tree form, with hardwood trees typically having seeds that are surrounded in tough shells, and losing their leaves in the fall. Softwoods, on the other hand, generally have seeds that are uncovered, and will keep their leaves during the winter. The wood itself is made from strands of cellulose fibres that are held together by lignin. The way these fibres are chained together is where wood gets its strength from because they spread the load across the entire length. You can see this structure in the grain, which is why it’s easier to split a board in line with the grain as opposed to across it. Different species of trees align these chains in different ways, so some turn out to be much stronger than other. Hardwoods, for example, have longer growth cycles so the structures inside are far more compact. This is also why their growth rings are so much closer together than in softwood varieties. The density of a wood is a good indicator of how strong it will be, and this is calculated by “Specific Gravity”- a number gained by dividing the weight of a set volume of the wood by the weight of the same volume of water. Compressive Strength – This is how much weight the wood can handle when exerted in parallel to the grain. This is the type of strength that is important in table legs for example. Bending Strength – This is how much weight the wood can handle when exerted perpendicular to the grain. This is the type of strength that is important when hanging something on a peg for example. It is also referred to as the modulus of rupture. Stiffness – This relates to how much the wood will bend when weight is applied perpendicular to the grain. An example of this is how much a shelf will droop. This effect is also referred to as the modulus of elasticity. Hardness – This is how resilient the finished wood piece will be to scratches, dents, and knocks. An example of this will be a kitchen counter and how long it remains looking like new without pieces chipping off. To give an indication of how much stronger these are than softwoods, the strongest by this measure is yellow pine. There are a couple of woods from around the world that are harder than Hickory, such as Brazilian Rosewood (Specific Gravity of 0.8) and Indian Rosewood (Specific Gravity of 0.75). Even though these woods are the hardest ones, most American hardwoods will be suitable for all but the most intensive projects. So, factors like availability, sustainability and cost are more of a priority. Timber is such a great natural resource that is perfect for use in construction. It comes in all sorts of different strengths and colours, with each one being far better for some uses than for others. If you’re looking for the strongest type of wood that is found in North America, then the answer is Hickory – but with Oak and Beech coming close behind.